T-Mobile US has launched Shadow, a khaki-coloured sliderphone the carrier claimed was the... er... 'official phone of fun'. Designed and made by Taiwan's HTC, the Shadow sports a 2.6in, 240 x 320, 65,536-colour screen. It's limited to quad-band GSM/GPRS/Edge cellular connectivity, but at least has Wi-Fi on board for faster web browsing and instant messaging - provided you're in range of a hotspot, of course. IM clients bundled with the phone include Windows Live Messenger, AOL Instant Messenger, Yahoo! Messenger and ICQ. Guess what T-Mobile reckons the Shadow's killer app is? The Shadow has a Qwerty keypad that looks to us a lot like the one on the BlackBerry Pearl. It also believes younger consumers will be attracted to the Shadow's picture sharing facility, enabled through the carrier's MyFaves tariff. Hence the 'phone of fun' tag. 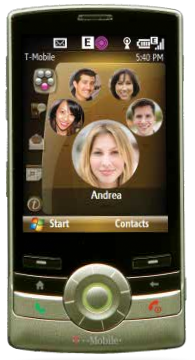 The Shadow runs Windows Mobile 6, but the phone has a unique front end that positions key features as icons in a curve running from the bottom left corner of the screen to the top right. The cursor is controlled by the Shadow's rotating-wheel navigator key below the display. The handset incorporates a two-megapixel camera and a Micro SD card slot for up to 4GB of removable storage capacity. It has Bluetooth on board too, including A2DP wireless stereo technology. T-Mobile hasn't said when the Shadow will go on sale - right now, it's asking interested consumers to hand over an email address for updates.